Save money with a Mortgage Broker? Lots of companies offer loans, and each company has different loan types. If you go to the bank and ask for a quote they will only show you their products, but not their competitors. The first loan types they show you are also likely to make them the most money. Working with a mortgage broker for real estate in the San Francisco Bay Area means you have someone who knows your financial situation, and shops around for the best offers from multiple lending companies. We know what criteria banks are looking for and how to help you qualify for the best possible loans. We only make money by finding you a good deal. Jim enjoys the challenge of finding the right loan products. He’s been helping people do this since 1999 when he founded Preferred Mortgage. If you’re dreaming of a new home Jim is driven to help you get the most value for your dollar and time. His extensive knowledge, diversity of loans, and personalized service make working with Jim a rewarding experience. Obtaining a loan with Jim’s help is also faster than going the direct lender route. He’s an expert at getting his clients pre-approved quickly and closing the loan in an expedient manner. If you have never purchased a home before then you are eligible for special incentives given by lending institutions and also the U.S. Government. Your financial situation is unique, and will allow you specific savings. Jim will help discover all the savings and benefits available to you. Since you’re a first time buyer the amount of savings is usually the highest. He’ll work hard to save you the most possible. Jim has the resources to help with your investment financing. He can find financing or offer cash-out options for up to 10 investment properties. He has conventional financing with as little as 10% down on purchases via Homepath and 20% down on Fannie and Freddie programs. With residential rents at all time highs and interest rates still at extreme lows it’s a great time to own rental properties. Jim can present you with competitive options or get you prequalified for your next investment. Best Home Loan Rates for San Francisco Bay Area? Talk to Jim, then you can decide for yourself. Our preferred lending status gets us access to some of the best home loan rates for the San Francisco Bay Area. Jim only makes money when he finds you a deal. There’s no obligation, no hassle, just good financial options. 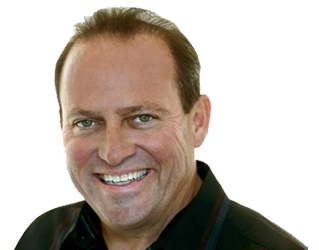 Jim is highly attentive, awarded for his service, and gets great reviews from his clients. Contact Jim about your goals and ask him to help you find the best possible rates. You’ll be glad you did. 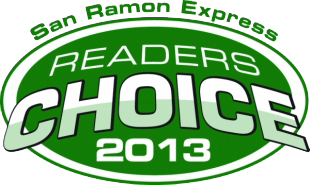 Each year Diablo Magazine surveys recent home buyers in the area. 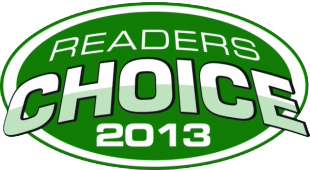 Based on the survey results they compile a list of the top mortgage professionals. 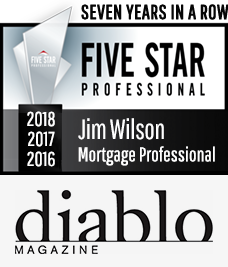 Jim Wilson has been honored to receive this award for 5 straight years putting him in the top 2% of East Bay Area mortgage professionals. This process helps you determine the amount you can borrow. Sign and complete the loan application and disclosures. At this time, income and credit verifications are completed as well as checks on your assets and liabilities. During the loan approval process, it is important not to significantly change the status of any of your financial accounts. Deciding on the loan amount and length of your loan period will help you determine if points and fees make sense. Do you plan to hold onto your property for an extended period? A fixed or a variable rate is one of many choices available to you. There are also several alternatives to points and fees. We can help you find the right loan program for you. Work with us to lock in your rate. You may be required to submit additional documentation before the loan can be approved. Your loan application will go through the final approval process which includes verifying the information submitted on your application. It is important to postpone making any major purchases or changing the status of your financial accounts. Large deposits and withdrawals must be documented. If you make any significant changes in your application information, please let us know beforehand. Review and sign loan documents. Check the documents carefully for the correct interest rate, loan amount, names and addresses. If you’re purchasing a property you may be required to bring a cashier’s check or to wire funds. Refinance loans on primary residences have a mandatory three-day rescission period. We get asked lots of questions about mortgages, credit scores, and interest rates. Here’s some of the most frequent home loan questions that come up when talking about Bay Area real estate. We hope you find them helpful. + What will a lender look at when I apply for a mortgage? When applying for a loan lenders typically look at your credit score, assets, down payment amount, household income, and overall debt. + What does it mean to get prequalified? Prequalification is an estimate of how much you will be able to borrow. You supply the lender with some basic information about your income, debts and assets. The lender checks your information and gives you a general estimate of home loan amount and monthly payments. Prequalification only takes a few minutes and it’s free. + What does it mean to get preapproved? With preapproval, lenders review some basics about your finances and provide you with an official letter that states that as long as you meet certain conditions, you will be approved for a specific loan amount and loan program. That allows you to shop with confidence, as sellers often require a preapproval when you go to bid on a home. 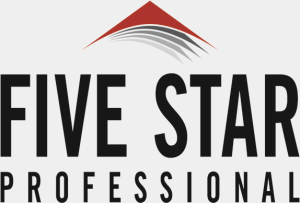 Learn more about the preapproval step in the loan process. + Do I have to have a specific property in mind? No. Often before shopping for a home, prospective homebuyers set a budget. Get prequalified or preapproved and we’ll help you determine how much of a monthly mortgage you can afford and how much you might be able to borrow. + What is the minimum down payment I can make on a home? It depends. Generally speaking, lenders require you to put down between 3.5% to 20% of the home’s value. See the side by side comparison of the mortgage programs. + Will I have to pay for Private Mortgage Insurance (PMI)? Typically, if your loan amount is more than 80% of the home’s appraised value, you will be required to obtain private mortgage insurance known as PMI. + What is the difference between a second home and an investment property? A second home is a home you use personally. The mortgage process for a second home is very similar to your primary home mortgage. An investment property is a property you rent out (become a landlord) or buy for the purpose of fixing up and selling at a higher value. This could be an apartment property, condominium, or single family residence. + What if I have had credit problems? Will I be turned down for a loan? Not necessarily. Even if you have had credit problems, you may still qualify for a loan. Your credit score is only one of the factors to qualify for a loan. Lenders also look at your employment history, income, debt, and cash reserves. + Can I apply a gift towards a down payment? FHA loans allow homebuyers to use gift funds to help cover the cost of the down payment. In many cases, some or all of the down payment may be a gift from a family member, the borrower’s employer or labor union, or a charitable organization. Annual Percentage Rate (APR): The rate of interest on a yearly basis which includes charges on the mortgage loan and the interest payment. Adjustable Rate Mortgage (ARM): A home loan program in which the interest rate and the monthly payment are adjusted at regular intervals according to the changes in a specified index. Credit Score: A numerical quantity reflecting a borrower’s credit worthiness. Used by lenders to find out the risk in approving a home loan. Closing: The final step in the loan process when the seller transfers title to the buyer, the buyer signs the loan documents and receives the loan amount from the lender. Closing Costs: Fees paid by the borrower at closing. These include charges for originating and processing the loan. Down Payment: The amount of cash which the home buyer pays towards the purchase price at closing. Debt-to-income ratio (DTI): The ratio of the monthly debt to the pre-tax gross monthly income. Escrow Account: Bank account into which lender deposits part of the monthly payments made by borrower. The deposits include payments towards property taxes, homeowners insurance and mortgage insurance. Fixed Rate Mortgage: A home loan program on which the interest rate does not vary throughout the life of the loan. Housing Ratio: The ratio of the monthly housing costs to the pre-tax gross monthly income. Mortgagee and Mortgagor: The former is the lender offering the loan and the latter is the borrower. Mortgage: A legal process by which you can take out a loan against your own property – residential or commercial. The same property is held as the security for the repayment of the debt. Mortgage Note: It is your written promise to pay off the loan amount on certain terms and conditions. The note also mentions what the lender is likely to do if you default. Private Mortgage Insurance: Insurance policy offered by an insurance company in order to protect the lender from losses if the borrower defaults on his payments. Rate lock/Lock-in: A written commitment which guarantees a fixed rate on your loan for a certain time period before closing. Usually, rates are locked for 30, 45 or 90 days till the closing date. Have an Area in Mind? Some other city? Just ask us. "Jim is a dedicated professional and an expert in his field; we had several experiences previous to working with Jim and were unable to 'get the job done'. Jim was determined to find a way to make it happen and did! While it was not easy, he stayed committed to the process and found solutions when it seemed there were none. Above all, he was a pleasure to work with and I give him my highest recommendation!" - Lanie G.